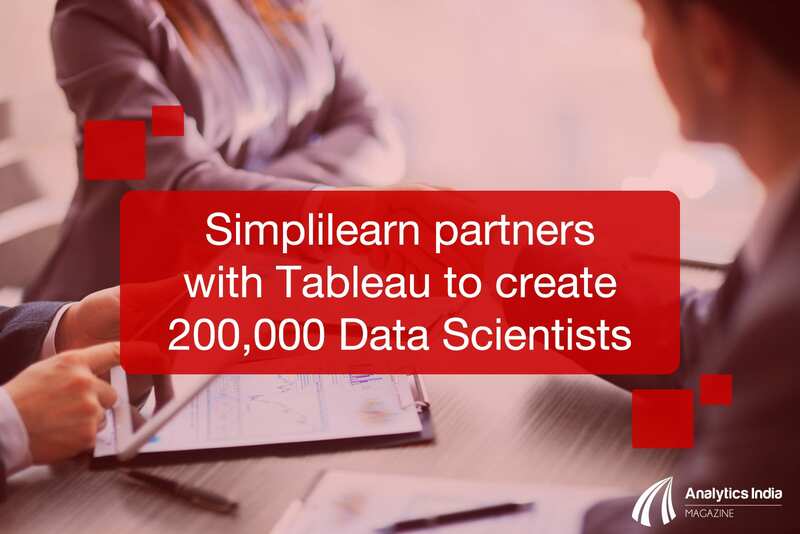 Two pioneers, Simplilearn and Tableau, one in education and the other in Business Intelligence respectively, have entered into a partnership today, with an aim to build a talent pool of 200,000 skilled Data Scientists by the year 2020. This partnership is good news for all the aspiring professionals in big data and analytics to hone their skills in data science and analytics with high quality instructor-led training, e-learning, and industry projects fulfilled on the latest version of Tableau. Ranked in the top 10 most influential education brands by LinkedIn, Simplilearn stands tall as the world’s leader in short certificate courses for working professionals. With over 400 courses offered in a variety of topics, they has trained more than 500,000 professionals since its inception in April 2010. On the other hand, Tableau Software is a global leader in rapid self-service, easy-to-use business intelligence software that systematically helps people access information, perform analytics and get instant results in the office and on-the-go. The software delivers fast analytics and business intelligence through creation of visualizations, reports and dashboards in minutes. Simplilearn recommends the Tableau Certification Training where aspirants will be provided with high quality on-demand live instructor led classroom training. The course comprises of over 32 hours of thorough training from experienced analytics experts coupled with four industry projects that are designed to provide learners with a hands-on industry experience. This holds true as, according to research by IDC, the global business analytics market generated $37.7 billion in 2013 and is estimated to grow to $59.2 billion by 2018. Thus, in line with the mission, it is imperative to create a strong talent pool of Data Science and Business Intelligence practitioners.